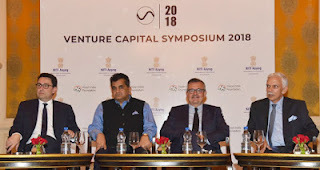 NITI Aayog has organized the Venture Capital Symposium 2018 in New Delhi. It was organized in collaboration with the Vision India Foundation. It aims to strengthen the economic relationships between India and France. It is a three-day event where the French investors will be interacting with 100 early to mid-stage Indian start-ups. The Venture Capital Symposium 2018 opens doors for French investors to explore Indian market and Indian startups to attain global outreach. It aims to provide French investors and business leaders a conceptual understanding of socio-cultural and political factors that shape Indian start-up ecosystems. The inaugural day of the Symposium was addressed by the NITI Aayog CEO Amitabh Kant along with DIPP Additional Secretary Atul Chaturvedi. It facilitated interaction between French investors, Indian investors, Indian start-ups and critical government functionaries. The basic objective of the Symposium was to support the Start-Up India programme launched by Prime Minister Modi. It aims to attract flow of foreign capital to India thus making India the most preferred destination for Foreign Direct Investment.